Female education, argues the United Nations, is the single most vital means to reduce global poverty and health disparities. Here, on a college campus in the United States where the female-to-male ratio is roughly even, the challenges of systemic sexism in education can seem remote. To bridge this gap and convey the intricacies of such a complex sociopolitical issue, faculty often explore teaching methods that help students see issues through a multifaceted global lens. That was the aim of associate professors of history Linzy Brekke-Aloise and Karen Teoh, who partnered to teach The Global Struggle for Female Education, a multidisciplinary Learning Community course. A confluence of interlocked issues such as poverty, race, political structure, sanitation and health, the lack of universal access to female education is considered by nongovernmental organizations to be a fixed barrier to global progress. To create the lens needed to help students see across the subject matter’s geographic and cross-disciplinary edges, Brekke-Aloise and Teoh looked for an outside-of-the-box digital approach. The Big Question: Why is Female Education So Contentious? The professors built the course from the ground up with an essential question as its foundation: Why, after years of progressive change, is female education so contentious? Brekke-Aloise and Teoh would provide the context behind that question’s answer — data illustrating the structural barriers to female education — and a survey of the international organizations dedicated to tearing them down. The students would evaluate the myriad ways these NGOs approach the problem, then curate and communicate a conclusion — not in a paper, but via a three-page website and blog. The idea, the professors note, was to take students from memorizing content to engaging with it, from thinking about solutions theoretically to serving as active agents of change. The Digital Innovation Lab would enable the shift, providing the necessary tools. As consultancy and collaborator, the lab provided constant partnership throughout the course’s development and implementation. Lab director Scott Cohen and student lab fellows delivered in-class tutorials highlighting evaluation methods for digital content, pairing liberal arts methods with digital means. A midcourse presentation on the blogger platform WordPress provided technical backbone for the students’ projects, while standing lab hours helped them master the nuances. The results — from a site supporting families victimized by sexual assault to an online curriculum portal for educators to teach women’s history — now serve as tangible proof, in digital form, of students’ newly acquired grasp of an intractable global issue. 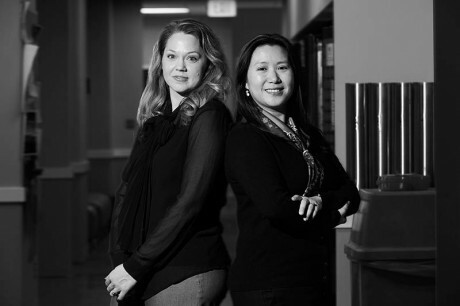 Ultimately, Brekke-Aloise and Teoh note, the digital approach enabled by the lab’s resources serves Stonehill’s mission in two key ways: by moving students from intellectual understanding of an issue toward compassion and action, and by providing them with a meaningful, real-world product that potential employers can access with a click.